Diamond Dental | #15: Should my child wear a mouthguard? 04 Feb #15: Should my child wear a mouthguard? Summer school holidays are ending and school starts for most in the next week or so. Carefree nights of beach walks and bbq’s are soon to be a thing of the past. Mad rushes from after school pick up to school tennis/karate/basketball/football (…you get the picture) lessons. 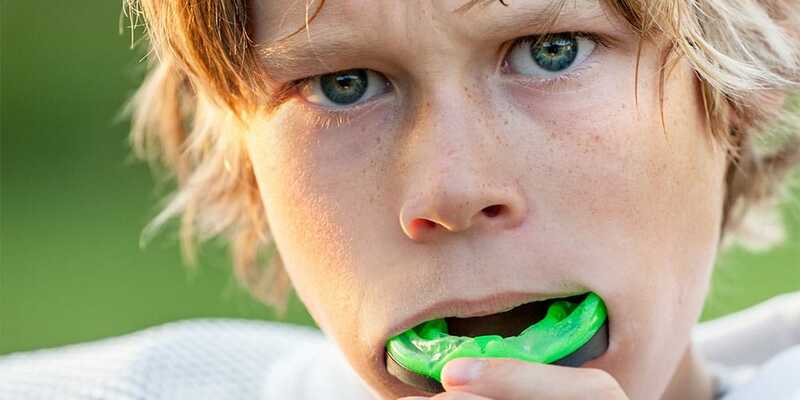 A mouthguard is a thin plastic tray custom fit to your child’s mouth. It protects the bone above the teeth and the teeth themselves. If your child gets in the way of a kick, punch, elbow or ball; a mouthguard cushions the blow. It can be the difference between extensive dental work and/or minor bruising. Anyone who plays a high impact or contact sport should wear a mouthguard. Young or old! It should be a part of your sport equipment as much as a shin guard or helmet. A lot of sports don’t need you to wear a mouthguard. Some of the worst accidents we’ve seen, are kids running into basketball ring poles. And even a trampoline landing gone wrong. Ouch! How do you get a mouthguard? You can buy pre-fabricated guards from sports stores- please be careful. Some don’t fit well and make the damage from an incident even worse. If choosing this option, please make sure it fits your/your child’s mouth. Your local sports club may have a registered provider of mouthguard’s who could offer a customised guard at a cheaper rate. Visit your local dentist and request a custom made mouthguard. Most health funds offer high rebates for preventative dental options (it’s cheaper for them to pay for a guard than expensive dental work!). We can even make the mouthguard in your/your child’s team colours! Remember baby teeth are as important as adult teeth! Protect them!